The spolem biology links and resources website has been going since 1999. It was long overdue an update! So here it is. All the links have been checked, and I am adding more often. The interactive quizzes are now here, I am currently adding more for first year A level topics. I am now adding worksheets from the old site, as well as some new ones. If you have a suggestion for a link to add, please use the contact form to get in touch. For other stuff that I have done see my blog. You will be able to add comments to blog posts, they will be pre-moderated. 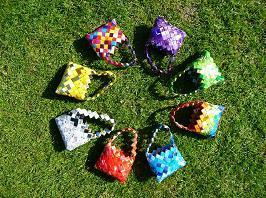 Here are the instructions for making crisp packet handbags, as a pdf file.